May Arts/PSA Essentials Week Giveaway! Want to plan some end of summer fun for the kiddos that doesn't cost alot and is sure to make you the best mom on the block? PSA Essentials was kind enough to share some fun stamps with the Ribbonistas. 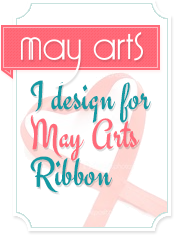 Head over to the May Arts Blog see the fun I created with this and comment to win....RIBBON, of course!! Thought I would poke my head out during a lull in the downpour and take a few pictures out the back door. I didn't take time to adjust the photos so they are raw right from the camera. This is the drainage ditch and pond behind the house. As you can see, they have become one. This ditch is normally dry and about 3-4 ft. deep. Oh, if you feel compelled to lay mulch...there are two pallets sitting there. Don't guess I'll be doing laundry for a few days as the septic tank is proably full...breaks my heart. Not!! Still sprinkling this a.m. Wreckers pulling cars out of the water at the entrance to our neighborhood. We are praying for those along the Gulf Coast. They're expecting 20 inches of rain and a storm surge. Hoping the tornado threat is over ..yesterday was a scarey day. Whew...I had intended it write this up last night, but Isaac decided to show us his east side, which is the strongest side of the storm. I flipped on the local news just in time to hear we were under a tornado warning (the scariest part of hurricanes), so I woke up DH, grabbed the dog, turned off the computer and decided to stay close to the safest area in our home until the warning passed. Thankfully, it passed uneventfully...our prayers now are focused on the Gulf area as Isaac picks up strength over the warm water. Now onto the mundane....the Clean & Simple Challenge on SCS (CAS185) is a theme this week - Summer Treats! My favorite summer treat - ICE CREAM!! Chocolate and vanilla with a little berry thrown in just for fun! Who needs cherries when you can have pearls, eh? I "waffled" my cone on the Scor-Pal and wrestled with myself whether or not to add ribbon or twine and opted not to. The feeder bands from Hurricane Isaac have begun to pelt us so I thought I better get this posted in case we lose power. We've had a few strong storms pass alrready. Our prayers are so for those on the Gulf Coast who will bear the full force of this storm. The Creative Belli Challenge #150 this week is Winged Things. I made a couple of cards with the waste basket rescues from Bev Gerard's WaterStamping Technique. This wet day seems like a perfect time for wet techniques! The butterfly on this card came from the lightest waterstamp rescue. I stamped it with Versamark then clear embossed it prior to cutting it out. For those of you who may not know what happened, I threw my first few tries at this technique in the trash then tossed the wet paper towel I was using on top of them. I was going to empty the basket when I spied the two pieces below and decided to rescue them. 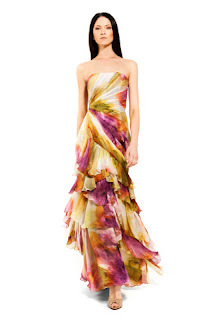 It still amazes me that both of these pieces resulted from the same colors that were blended just a bit differently. You can see the orange on the reverse side of the butterfly. When it blended with the purple, it turned a pretty pink color. I used the darker piece for a more dramatic card. I stamped this Rubbernecker Floral #10 simply in black and accenting the flowers with dots of black Stickles. Uh, oh...here comes another squall!! Foodie Friday this week is pizza! No, I did not make it but it is handmade at a little family owned shop in town, called Anna's. Homemade dough, sauce and this veggie pizza is to die for! A whole day's veggies on this one...broccoli, spinach, artichokes, muchrooms, tomatoes, red/yellow bell peppers...mmmmm...this is our every other Friday treat. If you're ever in S. Florida, you must look up Anna's. My DH, the meat eater, started eating my half of the pizza after he tasted this veggie version, now we just order the whole thing veggie! A single slice is more than enough!! Hello Wednesday! It's only Tuesday but it seems Julia (Stamping Ground) has graced us with an early post. I was actually in desparate need of some sketch inspiration so just popped on to see what was out there. Here's a peek at what I plan to use...I hope, anyway! It's a piece of the botched watercolor technique I attempted for SCS then rescued from the waste basket when I saw how beautifully it dried. A couple of Halloween stamps from the $1 spot at Michael's and some hook & loop tape from Tombow that I'm dying to try out on something. I'm playing with some Versamark and a butterfly from Rubbernecker Stamps...what do you think? 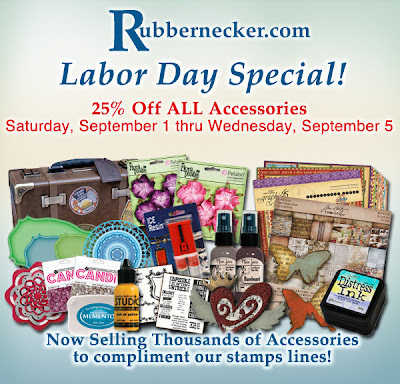 And, make sure you check out the Rubbernecker Stamps challenge link on the top sidebar....Prizes there, too! and finally....it's almost the end of the month so be sure to click on my giveaway link at the top of the page to comment on the right page if you'd like a chance at that Papertrey Ink gift certificate. It's just sitting in my account waiting for someone's name! May Arts/Basically Bare Blog Week - Back to School! It's my turn to share at the May Arts Blog!﻿ We've paired up with the DT from Basically Bare for a full week of inspiration and fun giveaways. Here's a sneak peek at my project. When cancer strikes anyone it's tragic but when it's children, it just breaks my heart. This week's Teapot Tuesday challenge Destination is Tyler. Tyler is a very sweet 11 year old boy who is currently in remission from Rhabdomyosarcoma, a childhood cancer. He must still undergo many surgeries to repair the devastation caused by the cancer. Tyler's family must continually raise funds for Tyler's travelling expenses. How wonderful that his family has found a compassionate and caring doctor who will perform his surgeries at no cost. The travelling back and forth is expensive, though. You can find more info at the Destination site here. Like all kids, Tyler loves to get mail and he loves strawberry milkshakes. Our challenge is to send Tyler smiles and jokes. I hope Garfield brings Tyler a giggle or two. Thanks for helping and if you can, could you please share this on your blog? Clean & Simple Monday - Back to School! It's back to school time...our grands still get a couple more weeks of free time. They go back when we used to - after the Labor Day holiday. Here in the sunny South though, most kids have already started or are starting school today. The Clean & Simple DT over at SCS are celebrating with an inspiration challenge based on the word, "School" (CAS184). 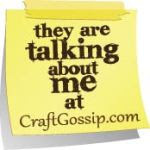 Psst....did you know the SCS DT is looking for a few good CAS stampers for the new Fall DT? Head over to see the details...hurry though...deadline is approaching! My DIL is a teacher so I have it on good authority that teachers can only use so many coffee mugs and apples but they LOVE food. Head over the May Arts blog to see what I did with these berry containers. 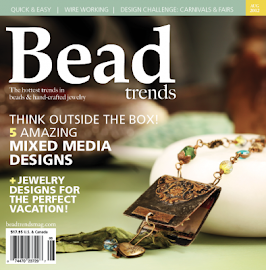 I've got a super quick and easy project for you on the May Arts Blog today. A few minutes of your time plus a bit of ribbon and you can make a game to keep the kids busy on a rainy day, at a picnic or a day at the beach. I haven't had time to play Teapot Tuesday MMTPT211 for awhile but this week's challenge broke my heart. James is a little boy dealing with the grown up disease of cancer. He has multiple tumors on his spine and brain. You can find James' Caring Bridge page at this link. His sweet smile will melt your heart. James loves dogs and pirates. I've been hanging onto my Billy stamps from Pink Cat Studio..now I know why. I'm in big trouble, though. We have to walk the plank if we bring skulls and crossbones...YIKES!! I did bring pieces of silver...ok, they're bling but who's counting? Thanks for stopping by...hope you can help brighten James day. 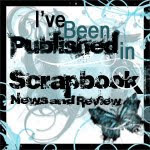 If you have a blog, could you please spread the word? Foodie Friday - Dinner's Ready! Ahem...ok, I've re-gathered my composure, well, mostly anyway..back to the recipe. I never really like pork chops until I found this way of cooking them...they were usually just dry and tough. The best part is that even when I'm busy, I can put a nice dinner on the table with almost no effort and the pork chops are absolutely divinely fork tender and flavorful. Toss some baked potatoes in the oven with the chops (I scrub mine, pierce with a fork, then put them in a zip loc bag with a bit of olive oil, coarse salt, and fresh garlic, rub them around then pop them into the oven.) steam some broccoli or other green veggie of your choice, add a salad and dinner is served. You can find a printable recipe for Lemon Pork Chops here. My workdesk is a mess as per usual...I snapped a photo of the set I used for the May Arts/Our Craft Lounge Blog week...did you know they're giving stuff away? Oh yes,they are!! So am I, so if you have a chance pop in and answer my questions to win. This set from OCL made me laugh out loud when I got it in the mail. Happy WOYWW ...don't forget to check my blog candy post while you're here...if you're follower! May Arts/Our Craft Lounge Blog Week and a Giveaway! 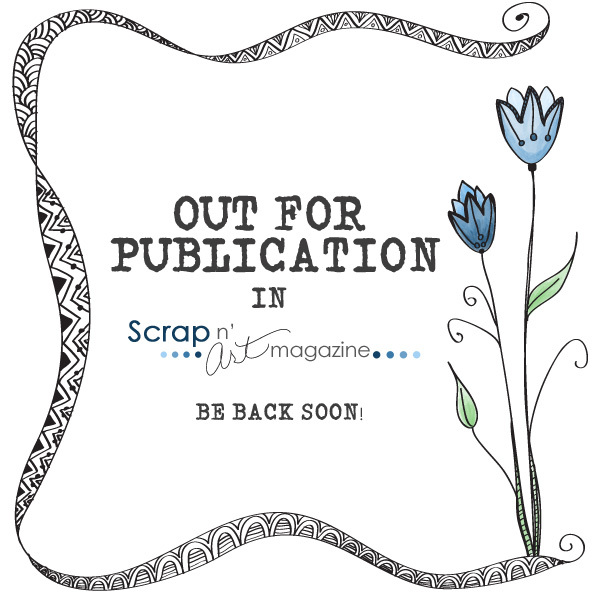 It's time for another super blog week with May Arts Ribbon and Our Craft Lounge! 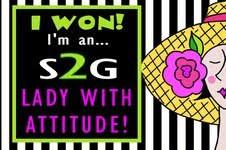 Be sure to check out the posts for the entire week on both blogs for your chance to win ribbon, stamps and other fun stuff!! Here's a sneaky peekie at my project for the hop. It makes me giggle every time I see it...and I've got a giveaway on my post. 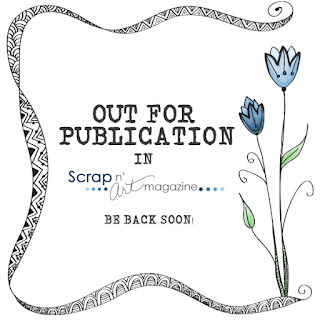 Just pop over over to see all the projects and see how you can win May Arts Ribbon, Our Craft Lounge goodies and more! !